Miracote MiraPatch RM 1 is a polymer-modified two-component smoothing and resurfacing compound for concrete floors and decks. Applied to any thickness from 3" to featheredge with superior adhesion to prepared substrates. MiraPatch RM 1 has very high compression strength and it can be left exposed to industrial-type traffic or covered with almost any type of floor covering - carpet, resilient tile, even the very hard troweled resin floor systems. Compared to conventional concrete toppings, MiraPatch RM 1 has greatly improved adhesion, greater abrasion resistance, less shrinkage, greater resistance to water and salt penetration, and better tensile strength. MiraPatch RM 1 is Zero-VOC, virtually odorless, and environmentally safe. It requires no special training for installation and is easily handled by a handyman mason. It sets rapidly, can be applied over damp (not wet) surfaces, and can be installed at temperatures as low as 50°F (10°C). Use MiraPatch RM 1 for interior or exterior structural repair applications on spalled, deteriorated or scaling concrete decks and industrial floors. 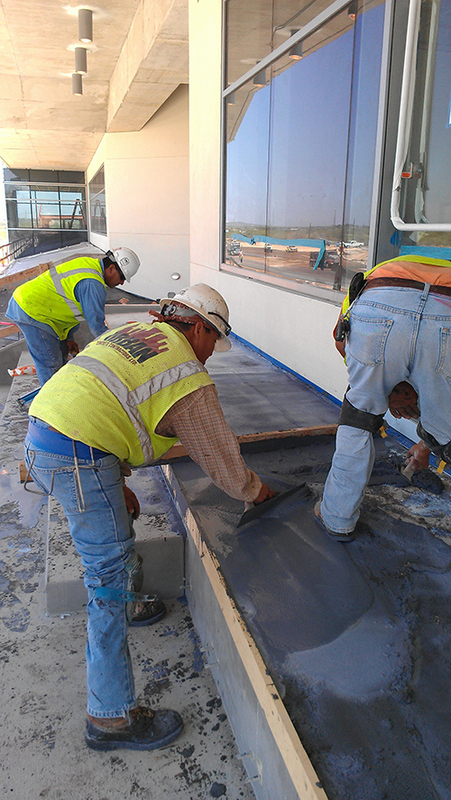 MiraPatch RM 1 is specially designed to prepare concrete for Miracote polymeric floor finishes. High-Build: can be applied from featheredge to 3" thickness. Non-Shrinking: no cracks or fissures, same co-efficient of expansion as concrete. Freeze-Thaw Resistant: water retardancy prevents cold weather scaling. Simple to use: pre-portioned mixing. Polymer-Fortified: self-curing and superior adhesion. (Gardner Impact Tester) delamination and not more than 0.014"